Some more touches from the tv series make their way into the Supergirl comic as Steve Orlando and Brian Ching serve up the debut issue. National City seems to be the DC equivalent to San Francisco, as Ching’s art provides us with steeply sloped streets and Victorian style housing. 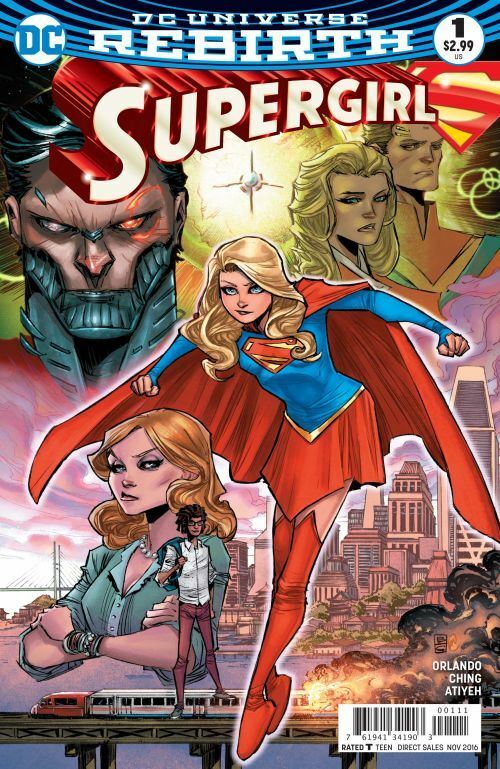 Although I do not care for the art on the cover, Ching is exceptionally good at creating both the world of Supergirl in National City, and also the life of Kara on Krypton. The issue includes numerous flashbacks to her days in Argo City. Many of these are meant to contrast with her life as a high school student on Earth. On Argo City Kara was quite advanced, at the top of her class. On Earth she is so unfamiliar with the technology, which is so far behind that of Krypton, that everything is far more of a challenge for her. The story also reiterates a theme brought up by the tv show. While Superman had decades to learn how to master his powers and function as a human, Supergirl has only had a few months. What is second nature to the older hero is an ongoing challenge for the younger one. Orlando has a lot of really witty lines and some very effective touches. While Kara views her life on Krypton as a golden memory, Cameron Chase, her boss with the D.E.O., sees Kryptonian society as inherently flawed and destructive. The attempts of the Danvers to provide Kara some elements of her old life fail. I really enjoyed the scene in which they attempt to speak to her in Kryptonian. Gotta give them an A for effort. Superman makes a cameo in this issue, in a flashback scene, giving Supergirl a key to the Fortress of Solitude. While nothing in her current Earth-based life seems to be working out the way she had hoped, she can maintain some degree of contact with her lost life through the Fortress. This issue also sees Cat Grant brought into the strip. Her role is quite different from that on the tv show. In this, she is still a reporter for the Daily Planet, but her scene is written as if Calista Flockhart was playing it, with all the arrogance and self-assuredness that characterizes her. The issue ends with a bit of a surprise, bringing back a dangling plot thread from the New 52 version. It’s a bit jarring, but only a little. We will have to wait for the next issue to see how Orlando harmonizes things, but it seems that he has subtly laid the groundwork. It’s so hard to talk about this without giving anything away. But I will not use spoilers!